February 28, 2018 -- To document vascular lesions linked with possible cause of death, radiologists will need to get familiar with the specific questions that the pathologist wants answered. While multiphase postmortem CT angiography is a simple, fast, and reliable technique that the radiographer can perform in around 30 minutes, the specific signs associated with motor vehicle accidents, homicides, cardiopathies, and medical liabilities are numerous and subtle. Radiographers, too, will need to step outside their comfort zone, delegates will hear at today's session on forensic imaging. Experts in the field will reveal that demand for -- and interest in -- this specialization is increasing. Professionals should become familiar with the type of findings likely to interest the forensic pathologist and optimal techniques to achieve specific visualization. Key to this collaboration is interdisciplinary teamwork. "The focus of the forensic pathologist is not always the same as that of the clinical radiologist," Alexandre Dominguez, technical manager of the anthropological and forensic imaging unit at the University Centre of Legal Medicine (CURML) in Lausanne and Geneva, Switzerland, told ECR Today. "Small lesions that have no importance in clinical work are of the utmost importance for forensic questions as they can give useful information about the mechanism of a trauma. Conversely, the radiologist may describe degenerative changes, which are less useful for the forensic pathologist." With this in mind, the CURML and the School of Health Sciences (HESAV) in the Swiss canton of Vaud together have established a multidisciplinary team with forensic pathologists, radiologists, and radiographers. 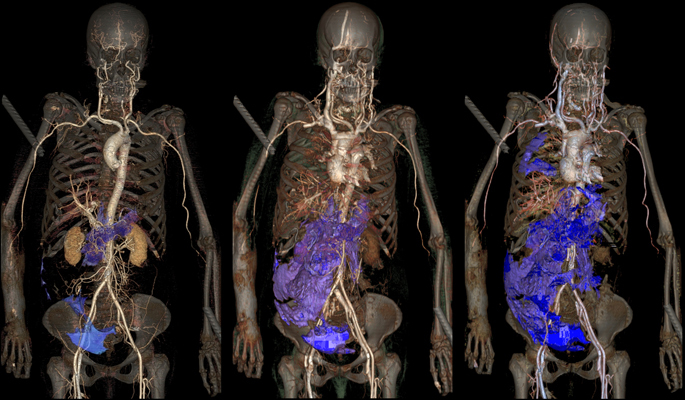 The main advantage of multiphase postmortem CT angiography is the visualization of the arterial and venous system before the autopsy. This depiction can help the pathologist guide and optimize the procedure. Reconstructed images allow visualization of lesions in two and three dimensions, making them understandable to prosecutors, police officers, and lawyers. Arterial phase (left): Results after injection into arteries, with a leakage of contrast media in the pelvis and with presence of a hemorrhage in the right side of the abdomen (blue). Venous phase (middle): Major hemorrhage in the abdomen wall (shown in violet). Circulation phase (right): Presence of an additional hemorrhage in the right pleural space (shown in violet). All images provided by Alexandre Dominguez, CURML & HESAV. However, there are also tricky areas for the radiographer, Dominguez noted. For instance, the cannulation of the femoral vessels is one of the biggest challenges for the radiographer, who is required to use a scalpel and perform a medical act. This step requires time to perform properly and a period of training and practice on several cases before cannulation can be achieved. "Dissection of the vascular wall or wrong placement of the cannula must be avoided," he warned. At today's session, Amy-Lee Brookes, a diagnostic and forensic radiographer at Great Ormond Street Hospital in London, will be highlighting how forensic imaging not only embraces postmortem examinations but also the imaging of individuals when images may be used as evidence in a court of law. Having knowledge of forensic imaging prior to practicing is essential not only for radiologists but also radiographers involved in this scenario. "One of the major pitfalls in forensic imaging for radiographers is lack of training, from a medicolegal, technical, and psychological aspect," she noted. "Those who practice forensic imaging without the correct training expose themselves to the legal consequences of mishandling evidence. Additionally, imaging can be done incorrectly, particularly in cases where inexperienced radiographers have no knowledge of working with rigor mortis, decomposed, or skeletal remains." A lack of knowledge can result in substandard imaging, particularly when digital x-ray is used as opposed to CT, she added. Brookes pointed to the psychological impact that might occur when radiographers involved in forensic imaging are exposed to harrowing situations, such as working with abused children or in disaster victim identification processes after mass fatality incidents. Without prior training or experience, individuals may incur an increased risk of developing post-traumatic stress disorder, but maintaining strategies and strict training regimes helps to minimize this risk. Training in forensic imaging can be acquired via several routes. Most radiographers will be involved in forensic imaging at a minor level, such as undertaking skeletal surveys for suspected physical abuse, but they will not be specialized in forensic radiography, she noted. These radiographers are usually trained within their own hospital following set national guidelines. "Specialized forensic radiographers generally attain postgraduate qualifications in a forensic field and often participate in research. It is not practicable for all radiographers undertaking routine forensic imaging to gain postgraduate qualifications, although this will remain the gold standard for a practicing forensic radiographer," she said. In the U.K., radiographers can refer to best practice guidelines for clinical forensic radiography. Most recently a joint guidance document on the radiological investigation of suspected physical abuse in children was produced by the Royal College of Radiologists and the Society and College of Radiographers and endorsed by the Royal College of Paediatrics and Child Health. This document has greatly influenced daily forensic practice in clinical departments. Focusing on disaster victim identification imaging, Jeroen Kroll, a radiographer in the department of forensic radiology at Maastricht University Medical Centre in the Netherlands, will reveal the future opportunities and challenges that imaging staff will face. He plans to highlight how imaging will allow for complete documentation of victims without opening body bags, with data made available to all experts involved in an official disaster victim identification. However, he warned that erroneous collection of evidence or information might prevent it from being used in the process, just as incorrect handling of forensic evidence might prevent it being used in criminal investigations. He underlined that Interpol regulations had to be followed at all times by dedicated radiology response and disaster victim identification teams. Originally published in ECR Today on 28 February 2018.